Methicillin-resistant Staphylococcus aureus (MRSA) infection has become a common infection in the community. It is caused by a strain of staph bacteria that is resistant to the antibiotics commonly used to treat ordinary staph infections. Most MRSA infections occur in people who’ve been in health care settings, but it has become more frequent in schools and public places. MRSA lives in the nose and on the skin of humans. MRSA is spread by coming in contact with an infected person or by exposure to a MRSA-contaminated object or surface. 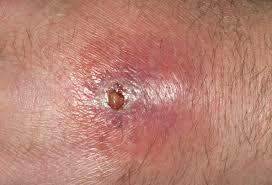 It often presents as red pustules, boils, or cystic lesions on the body. Cultures should be obtained from the site of infection to determine which antibiotic will be most effective in treating MRSA. There are a few oral antibiotics that are usually effective, although in some instances intravenous antibiotics are used to treat severe infections.